Egyptians are scheduled to go to the polls between October and December to elect the first parliament since the ouster of Islamist president Mohamed Morsi. This year's election represents the third and final part of the political roadmap put forward after the ouster of Mohamed Morsi in 2013. The first step was a new constitution, passed by a public referendum on 18 January 2014, and the second was the election of a new president, former army chief Abdel-Fattah El-Sisi, on 8 June 2014. The Egyptian government is hoping these polls will demonstrate to the international community that it is moving towards building democratic institutions, as well as sending a message that Egypt has become politically stable and open for investment. Parliamentary elections were originally scheduled to be held between 12 March and 7 May 2015, but the Supreme Constitutional Court ruled on 1 March and on 7 March that two key election laws – the Division of Electoral Constituencies Law and the House of Representatives Law – were unconstitutional. The court ordered that boundaries of electoral constituencies in 13 governorates be redrawn to achieve equality among candidates in terms of number of voters and geographical size. It also said that Egyptians with dual nationalities should have the right to run in parliamentary elections. These two laws, as well as the Exercise of Political Rights Law, were amended by a 15-member judicial and legislative committee in order to incorporate the court's instructions. The amendments were ratified by President El-Sisi on 9 July, thus paving the way for the long-delayed polls to be held. The Higher Election Committee (HEC), a seven-member judicial committee in charge of supervising the polls, announced the timetable for the polls at a press conference on 30 August. The polls will be held between 17 October and 2 December and are divided into two stages, the first for voters in 14 governorates and the second for those in the remaining 13. Candidate registration took place between 1 and 12 September. A bicameral parliamentary system had been in place in Egypt since 1980, comprised of the People's Assembly (the lower house) and the Shura Council (the upper house). The 2014 constitution, however, abolished the Shura Council and replaced the People's Assembly with the House of Representatives. 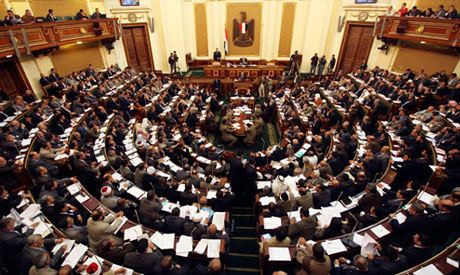 The House of Representatives will be composed of 596 MPs, the highest number in Egypt's 150-year parliamentary history. Out of the total, 448 will be elected as independents, 120 as party-based deputies, and 28 will be appointed by the president. According to the constitution (Article 102), the president of the republic is authorised to appoint a number of public figures as parliamentary deputies, with the stipulations that this number does not exceed 5 percent of the total number, that at least half of the appointees are women, that they are not members of one political faction, and that they are people who have performed outstandingly in their professions. According to the constitution (Article 106), parliamentary elections will be held every five years. The HEC has ruled that an independent candidate cannot spend more than LE500,000 in the first round and LE200,000 should a run-off take place. A list of 15 candidates cannot exceed the spending limits of LE2.5 million in the first round and LE1 million in the case of a run-off. A list of 45 candidates cannot exceed the spending limits of LE7.5 million in the first round and LE3 million in the case of a run-off. Each candidate is obliged to open an account with any of two state-owned banks – the National Bank of Egypt or Banque Misr – and with Egypt Post Office to deposit money and donations allocated to spending on election campaigns. The HEC must be informed of the bank account. Candidates are prohibited from using religious slogans or racially discriminatory slogans, or using mosques or churches to campaign. Violation of these rules could lead to the offenders' elimination from the list of candidates. The first stage will include 14 governorates: Giza, Fayoum, Beni Suef, Minya, Assiut, New Valley, Sohag, Qena, Luxor, Aswan, Red Sea, Beheira, Alexandria and Marsa Matrouh. Elections for the first stage will occur for Egyptians abroad on 17-18 October, while voters in Egypt will go to the polls on 18-19 October. If there is a run-off, voting abroad will take place on 26-27 October, while voting in Egypt will be on 27-28 October. A total of 286 seats will be up for competition in the first stage, with 226 seats for independents and 60 seats for party-based lists. The 226 independents will be elected from 103 constituencies, and the 60 party-based candidates will come from two constituencies (one with 45 seats and the other with 15 seats). The breakdown of the 226 independent seats will go as follows: Giza (37), Fayoum (15), Beni Suef (14), Minya (25), Assiut (20), New Valley (4), Sohag (22), Qena (15), Luxor (6), Aswan (8), the Red Sea (4), Beheira (27), Alexandria (25), and Marsa Matrouh (4). The North, Middle and South of Upper Egypt constituency, which includes eleven governorates, will elect 45 MPs. They will be divided as follows: Giza (11), Fayoum (4), Beni Suef (3), Minya (6), Assiut (5), New Valley (1), Sohag (6), Qena (4), Luxor (2), Aswan (2), and the Red Sea (1). The West Delta constituency, which includes three governorates, will elect 15 MPs. They will be divided as follows: Alexandria (7), Beheira (7), and Marsa Matrouh (1). Campaigning for the first stage will kick off on 29 September and last until 15 October. There will be a day of campaign silence on 16 October. This will be followed by the vote for Egyptians abroad on 17-18 October and for Egyptians inside Egypt on 18-19 October. Results will be announced on 20 October. Unsuccessful candidates can file appeals against the results for two days, or between 20 and 21 October. The HEC should give a final say on these appeals on 21 October. In case of a run-off round, campaigning will be for four days or between 21 and 24 October, while 25 October will be a day of campaign silence. The run-off vote for Egyptians abroad will be on 26-27 October, and for resident Egyptians on 27-28 October. The final results of the 14-governorate first stage will be announced on 29 October. Unsuccessful candidates in the first stage run-off round will be allowed to file appeals against the results on 29-30 October. The HEC should give a final say on these appeals on 30 October. The second stage will include the remaining 13 governorates: Cairo, Qalioubiya, Daqahliya, Menoufiya, Gharbiya, Kafr El-Sheikh, Sharqiya, Damietta, Port Said, Ismailia, Suez, North Sinai, and South Sinai. Elections for the second stage will occur for Egyptians abroad on 21-22 November, while voters in Egypt will go to the polls on 22-23 November. In the case of a run-off, voting abroad will take place on 30 November and 1 December, while voting in Egypt will be on 1-2 December. A total of 282 seats will be up for competition in the second stage, with 222 seats for independents and 60 seats for party-based lists. The 222 independents will be elected from 102 constituencies, and the 60 party-based candidates will come from two constituencies (one with 45 seats and the other with 15 seats). The breakdown of the 222 independent seats will go as follows: Cairo (49), Qalioubiya (25), Daqahliya (29), Menoufiya (20), Gharbiya (24), Kafr Al-Sheikh (16), Sharqiya (30), Damietta (7), Port Said (4), Ismailiya (6), Suez (4), North Sinai (5), and South Sinai (3). The Cairo, South and Middle Delta constituency, which includes six governorates, will elect 45 MPs. They are divided as follows: Cairo (14), Qalioubiya (7), Daqahliya (8), Menoufiya (5), Gharbiya (7), and Kafr Al-Sheikh (4). The East Delta constituency, including seven governorates, will elect 15 MPs. They include: Sharqiya (7), Damietta (2), Port Said (1), Ismailiya (2), Suez (1), North Sinai (1), and South Sinai (1). Campaigning for the first round of the second stage will kick off on 5 November and last until 19 November. There will be a day of election silence on 20 November. It will be followed by the vote for Egyptians abroad on 21-22 November and for Egyptians resident in Egypt on 22-23 October. Results will be announced on 24 November. Unsuccessful candidates can file appeals against the results for two days, or between 24 and 25 November. The HEC should give a final say on these appeals on 25 November. In case of a run-off round, campaigning will be for four days or between 25 and 28 November, while 29 November will be a day of campaign silence. The run-off vote for Egyptians abroad will be on 30 November-1 December, and for resident Egyptians on 1-2 December. The final results of the 13-governorate first stage and the ballot in general will be announced on 3 December. Unsuccessful candidates in the first stage run-off round will be allowed to file appeals against the results on 3-4 December. The HEC should give a final say on these appeals on 4 December. Officially successful candidates in the two-stage parliamentary elections will be allowed to receive their parliamentary membership cards between 3 and 20 December. The constitution states in articles 208 and 228 that the Higher Election Committee is responsible for the overall supervision of the electoral process until the formation of a permanent electoral commission, the National Electoral Commission. The commission will be exclusively responsible for administering and supervising all kinds of general elections and referendums in the post-2015 period. The HEC is a judicial body of seven led by the chairman of the Cairo Appeal Court, Ayman Abbas. The other members are two deputies to the head of the Court of Cassation, Mostafa Shafiq and Adel El-Shorbagy; the two most senior deputies to the head of the State Council, Mohamed Qishta and Magdy El-Agaty; and the heads of Alexandria's and Tanta's Appeal Courts, Sirri El-Gammal and Ahmed Sabry Youssef respectively. There is another list of six reserve members. As El-Agati was appointed minister of state for legal affairs on 19 September, the deputy head of the state council, Mohamed Raslan, will replace him. On election day, around 16,000 members of different judicial bodies (judges, State Council members, prosecutors, and administrative prosecutors) will take charge of supervising the polling stations, and will be assisted by civilian members of the local city councils. According to state officials, the Egyptian police and army will take charge of securing the polling process in different governorates. They will be stationed outside the polling units and working under the direct orders of judges in charge of supervising the election process. Under the last twenty years of former president Hosni Mubarak's regime, or between 1990 and 2010, the individual candidacy system was used to elect members of parliament. Parliaments from 1990 and 2010 were composed of 444 elected MPs and 10 appointees, giving a total of 454 MPs, with citizens electing two deputies per constituency. This meant that the 444 MPs were elected from 222 constituencies. In 2010, the number of deputies (the People's Assembly at that time) increased to 518, as 64 seats were allocated for women, in fulfillment of a new quota. In 2012, after Mubarak was ousted from office, the number of seats decreased to 518 (including ten appointees), with two thirds of seats elected via party lists and one third as independents. This mixed electoral system was ruled unconstitutional by the Supreme Constitutional Court on 12 June 2012 on the grounds that it was discriminatory against independents, and as a result the 2012 parliament was dissolved. After Morsi was ousted and a new constitution was approved in January 2014, a new parliamentary election law (the House of Representatives Law, or Law No. 46 of 2014) was promulgated, establishing a mixed electoral system that put the total of parliamentary deputies at 596. Of these, 448 members will be elected as independents; 120 as party-based candidates; and 28 (or 5 percent) as presidential appointees. The new electoral constituencies law ratified by President El-Sisi on 9 July complements the parliamentary elections law. It divides Egypt into 205 individual electoral constituencies and four geographical constituencies for closed party lists. Unlike previous elections in which each individual electoral constituency will elect two independent candidates, this time these constituencies can elect one, two, three, or four candidates depending on geographical size and population. The 205 individual constituencies must produce a total 448 independent MPs. When a citizen goes to the polling station, he or she will be given two papers: the first showing a list of independent candidates and the other including closed lists of party-based candidates. For the first paper, he or she must elect one or two or three or four independents, depending on how many individual seats are reserved for his/her own constituency. In Cairo, for example, in the first constituency, Al-Sahel, a voter must select two from the list of independent candidates. This is different from Cairo's sixth constituency, Nasr City, where voters have to elect three independents, and from Cairo's 19th constituency, Maadi, where voters will have to elect just one independent, and from Cairo's 23rd constituency, Helwan, where voters will have to elect four independents. If a candidate secures more than fifty percent of the votes in the first round, they are elected. If not, they face a run-off. Unlike the 2011 election law which adopted a proportional list system, the 2015 electoral system opted for an absolute or winner-takes-all closed list system. Under the proportional list system, if a political party gets 20 percent of the vote per constituency is entitled to get two seats, and it gains 3 seats if it gets 30 percent of the vote, etc. The winner-take-all system is different. The party list which gets more than 50 percent of the vote per constituency takes all the seats in that constituency. The 2015 electoral system divides Egypt's 27 governorates into four geographical constituencies for the closed lists, two which have 45 seats and two which will elect 15 deputies, giving a total of 120 seats. Cairo, South and Middle Nile Delta (including six governorates; 45 seats). North, Middle and South of Upper Egypt (including 11 governorates; 45 seats). West Delta (including three governorates; 15 seats). When a voter goes to the polls, they must select one party list. The number of MPs depends on the constituency. If the voter lives in Cairo, they will have a ballot showing different party lists, with each including 45 candidates. But if they live in Alexandria, for example, the ballot will include different party lists of 15 candidates only. The closed party list system was attacked by many political parties who recommended that the proportional list system be re-instated on the grounds that it guarantees representation for all political parties. In response, the committee which drafted the law said the proportional list system cannot be adopted because the constitution (in Article 102) stipulates "fair representation" for all sectors of society. Article 5 of the House of Representatives Law states that each party list must include Christians, farmers and workers, young people, handicapped people, and expatriate Egyptians. The committee insisted that the closed, rather the proportional system, guarantees implementing this constitutional and legal stipulation. The Higher Elections Committee announced on 25 August that 87 NGOs – 81 Egyptian and six foreign -- have permission to observe the upcoming elections. Various international bodies will also be monitoring the polls, including Arab League, the African Union and the European Union. The HEC also announced that 44 press and media institutions, as well as 13 news websites, would be allowed to cover the elections, while 768 foreign media correspondents have successfully registered to cover the elections across Egypt. The HEC said it has adopted the official figures released about Egypt's population and electorate on 1 June as the basis for the polls. Citizens eligible to vote: approximately 54.841 million, up by one million from 2014. Egyptians have the right to vote at 18 years of age. Article 2 of the political rights law (Law 45 of 2014) details that citizens not allowed to vote include those who suffer from mental disorders or under judicial interdiction or convicted of corruption charges, etc. Active members of the armed forces and police are exempt from voting until they leave service, resign or retire. They include around 350 main polling stations and an estimated 30,000 auxiliary ones. The HEC said each auxiliary polling station will cater to 3,200 voters. A voting centre – usually a school or a sporting club - could accommodate two or three auxiliary polling stations. The vote will begin at 9am and end at 9pm, though supervising judges have the authority to allow more time if necessary. Judges in the auxiliary polling stations will take charge of the count and send an official statement of the detailed results to the nearest main polling stations. In turn, main polling stations will then send the results from constituencies to the main governorate counting station (headed by the chairman of the Appeals Court in each governorate), which will send the official results to the HEC's headquarters in Cairo. The HEC said it alone is mandated to announce the official results of the poll. "No result of the poll can be announced ahead of the committee's official statement on it," the HEC's chairman, Ayman Abbas, has said. Egypt's law on political rights was amended in 2014 to stiffen penalties on voting offences (Articles 56 to 73). Those who try to vote twice, or try to vote although they have been stripped of their political rights, or vote on someone else's behalf using their name, or announce results of the polls ahead of the HEC's official statement, will face harsh prison sentences of up to 10 years. The orders of the HEC, however, are not immune to judicial appeal. The HEC said citizens of 18 years of age and above have the right to vote. They must take note of the polling station in which their names are registered (usually the one as near as possible to their place of residence). Inside the polling station, they will have to give their national identity cards or passports to supervising judges, sign their names, put their thumbs in red ink and then cast their votes in the assigned glass boxes. The blind and disabled cannot vote by themselves. They are obliged to be accompanied by others who will vote on their behalf or ask judges available at polling stations to vote on their behalf. The HEC is also in charge of regulating the voting of Egyptian expats. The vote will be supervised by the diplomatic and consular corps in Egyptian embassies. In 2014, as many as 127 Egyptian embassies and 11 consulates were designated as polling stations. Although the number of Egyptians living abroad is estimated at 10 million in 2014, only around 700,000 registered to vote. The results will be sent to the foreign affairs ministry, which will forward them to the HEC. There are no official figures about the cost of Egypt's coming parliamentary polls. But as Egypt's public referendum in 2014 cost LE2 billion, many expect that the cost of this year's poll will be as high as LE3 billion, including the expenses of judicial supervision, the deployment of security and army forces, and logistical support. The HEC has announced that an estimated number of 5,900 prospective independent candidates, plus 12 party lists, had submitted applications by the end of the registration period. The committee, however, announced on 16 September that the applications of more than 500 independents had been rejected for different reasons, thus lowering the number of independent candidates to 5,420. The HEC also said that only nine party lists – out of 12 – had been accepted. A final list and number of candidates will be announced by the HEC on 1 October. The HEC also announced that as many as 308 women will contest the polls as independents. The party lists will also include female candidates. An independent candidate or a party list running unopposed in certain constituency can't be automatically declared the winner. It must get five percent of the vote in this constituency in accordance with Article 24 of the House of Representatives Law. Who can run in the polls? Egyptians over 25 years of age, unless their political rights have been rescinded or suspended, have the right to run in the parliamentary elections. The HEC also announced that Egyptians with dual nationality will be allowed to run in elections for the first time, in line with the Supreme Constitutional Court's March ruling. Who are the main competing factions? As the coming parliament has reserved the majority of seats – 448, or 73 percent – to independents, most of the candidates have applied to run as independents. Many of these were fielded by the country's different political parties, while others decided to run for the first time, and some were members of former president Hosni Mubarak's ruling party. The number of seats allocated to party-based candidates stands at 120 or around 27 percent of the total. Some political parties have decided to run in the polls as electoral coalitions, while others opted to act on their own. The Salafist Nour Party, the only Islamist group contesting the polls, has fielded party lists in two constituencies, competing for 60 seats – in Cairo, South and Middle Nile Delta; and in West Delta. Eight non-Islamist electoral coalitions will be contesting the polls. The For the Love of Egypt coalition, which includes the Wafd Party and the Free Egyptians Party among others, had submitted lists of candidates for each of the four constituencies, contesting all 120 seats. The coalition includes many high-profile candidates ‎including journalists, businessmen, former judges, and former cabinet ministers. For the Love of Egypt representatives have said they support El-Sisi and want to see the coming parliament cooperate with him to solve the country's political and economic problems. Other electoral coalitions running in the polls include the Egyptian Front Coalition. This is closely associated with the toppled Mubarak regime. Representatives of the coalition believe that the revolution against Mubarak in 2011 was an American conspiracy and strongly support the crackdown on the Muslim Brotherhood, aiming to prevent all religious parties from exercising political rights. Other coalitions contesting the polls are the Independence Current, the Republican Alliance of Social Forces, the Independent National Reawakening bloc, and the Call of Egypt. Most of the above coalitions strongly support the 2013 ouster of Islamist president Mohamed Morsi, and the subsequent move to designate the Muslim Brotherhood a terrorist organisation. As the Brotherhood was listed as a terrorist organisation in December 2013 and its political party – the Freedom and Justice Party – was dissolved, it will not be able to run in this election. The 2014 constitution granted parliament greater powers, turning Egypt from an absolute presidential system into a mixed presidential-parliamentary system. Articles from 101 to 138 give parliament the power to revise all laws enacted since Morsi's ouster – it can revise, reject, or ratify them – as well as to oversee the executive branch and endorse the annual state budget. The government appointed by the president must get the prior approval of parliament. Parliament can also withdraw confidence from the president. Dear AO Maybe change the title to "Egyptian Parliament elections - for dummies" I think that would relate more. I believe Egypt as a whole needs to simplify its various bureaucracies into a system an "idiot" can understand and deal with. Dear AO, Thank you for clarifying the political correctness of the wording! My humble apologies if I offended any of my fellow Egyptians (yes I am Egyptian). Masri, I too an Egyptian living abroad and very well educated. I commend you to keep up the great work and show the world Egyptians are smart! "Allen" if that's your real name, you know what you can do to yourself! Do you really need to call it an "idiot's guide"? Do you think Egyptians are idiots and don't understand the process of voting for parliamentary elections? Unbelievable! Ok "Allen", if that is your real name! As an Egyptian living abroad, like Masri, I have a bachelor's degree in Economics and Master's degree in Business Administration. I can talk to you a lot about politics, but it's like talking to a brick wall! In any case, I was simply mentioning to AO "idiot's guide" and it's political correctness. Thanks for clarifying AO, I will not reply to you any further as you are the clear definition of idiot! Well " Steve " if the definition fits you, and obviously it does, no point getting indignant. Simple language nuances of English terminology obviously is a challenge for you. Which obviously exposes your fake western name. As an Egyptian living abroad with 3 degrees, including a PhD, I find the parliamentary election process in Egypt rather complicated. AO did a good job clarifying what seems like a maze and unique mix of party and individual seats. The term “Idiot’s guide to …” is a common term invented and used a lot in the US, the country that invented, perfected, and abused “Political Correctness” So it doesn’t mean any derogatory thing. Good job AO!